Published November 2007,December 2007,May 2009,February 2011. You can begin to explore Conway's tangles with the NRICH Problem "Twisting and Turning". The article "Symmetric Tangles" explores the symmetry of tangles. This is a personal story of discovery that began in February 2007 when a colleague of mine, Ian Short, showed me an interesting trick he'd seen in a lecture given by the mathematician John Conway in Cambridge in 1998. At the very start of that lecture, he said this, "What I like doing is taking something that other people thought was complicated and difficult to understand, and finding a simple idea so that any fool and in this case, you can understand the complicated thing." There is a real player video stream of a similar lecture delivered by Conway to an audience of mathematicians at http://www.msri.org/publications/ln/msri/1997/ldt/conway/1/index.html . I'm working on a 3D tangle environment. You can use this environment to explore tangles without having the ropes to hand, but you'll find that the tangle looks ever more and more tangled, and never simplifies. I'm trying to use tangle theory to help us program this environment to do the disentangling too. It's not so easy, but tangle theory should make it possible! 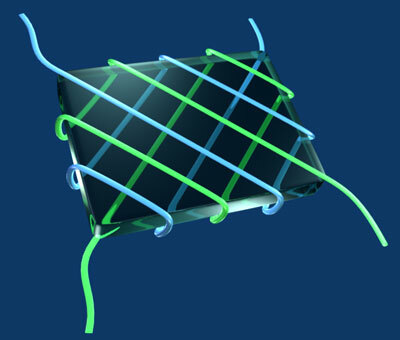 You can also use the Geomlab environment to explore tangles. The NRICH version of Geomlab has some useful tangle functions built into it. ZERO - draws the zero tangle. ONE - draws the tangle with one twist. twil(list) - draws a tangle from a list of twists. Twil([2,3]) will twist twice, then turn, then twist thrice. twirl(list) - is simlilar to twil, but the list is reversed first. The result is easier to use.